Liverpool captain Steven Gerrard has called for Uefa to make sure the club do not have to play on the anniversary of the Hillsborough tragedy. The second leg of the Champions League quarter-final could fall on 15 April, the 20th anniversary of a disaster in which 96 people died. "You would think they would accept the significance but feelings don't always come into it," Gerrard said. Liverpool have requested that Uefa let their tie be staged on 14 April. The Premier League side thrashed Real Madrid 4-0 at Anfield on Tuesday to reach the last eight but, with the draw for the next round taking place on Friday, Uefa has yet to confirm whether Liverpool will have to play on the day. 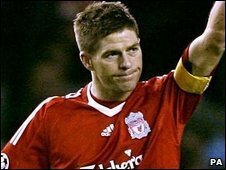 "We hope that Uefa shows some common sense," Gerrard added on the club's website. The disaster happened shortly before Liverpool's FA Cup semi-final against Nottingham Forest when Liverpool fans packed in behind a goal at Sheffield Wednesday's Hillsborough ground were crushed to death. The midfielder said the club should not be expected to play on the anniversary of the day when so many of their supporters died. "We're still waiting to see whether Uefa will make us play on the day. That would be far from ideal given all the emotion that always surrounds the club on that day. Gerrard grew up in Liverpool and lost a cousin in the disaster. "It should be a time that Liverpool Football Club remembers the people who were lost and their families," said Gerrard. "Hillsborough is always on my mind because I lost a member of my family there and any success we get as a club this year will be dedicated to those people who lost their lives."